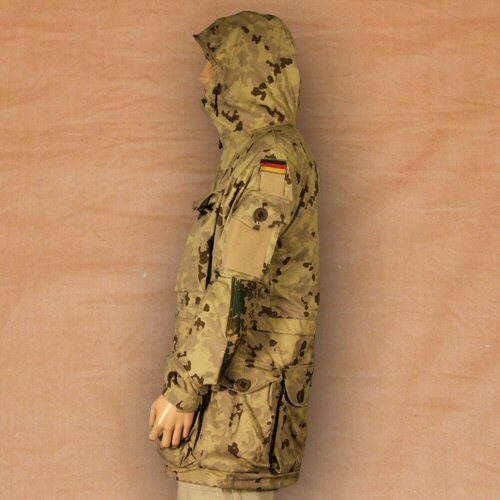 The latest specially developed desert camouflage (Wuestentarn), only issued to special operational units of the German Army in the enhanced field use uniforms instead of standard cut uniforms. 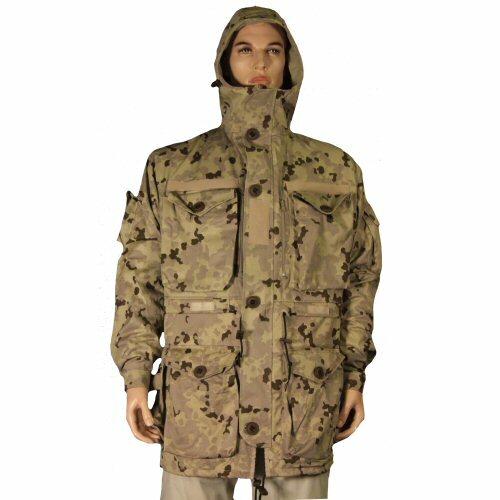 This is the genuine issue KSK smock, only from the military contract manufacturer, with the following features: lighter weight tropical fabric; lined hood, seat, front; wired hood with velcro tag adjustment for height and toggle adjusted drawstring; tall collar with velcro over baffle; quality large metal core double zipper; large left and right dump pockets with zip opening, internal zip pockets left and right, baffle covering zipper for protection against dust and damp secured with velcro and slotted buttons; extra long underarm zippers for ventilation; velcro patches for name tapes over left and right chest pockets; velcro tabs on front centre and each arm for rank or identification patches; Cordura reinforced elbow patches which open to accept padding; 7 large capacity bulgy pockets located on chest, front and sides of jacket; FFD type bulgy pocket on right arm; extra long bulgy pocket on rear secured with three slotted buttons; flat pocket on left arm with velcro; velcro shut wrists; heavy duty drawstring at waist and hem secured with adjustable toggles; quick dry 65% cotton 35% polyester fabric blend. 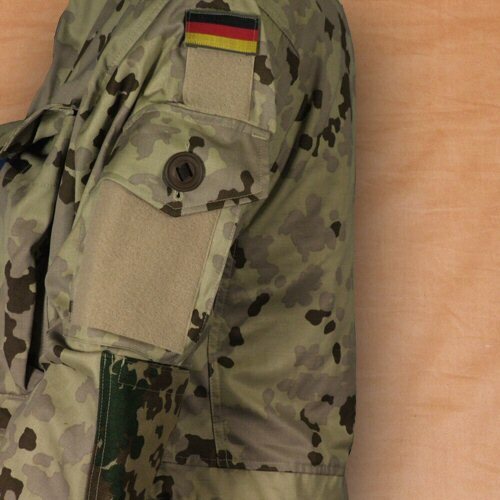 Elbow cordura patches are in milpec 1000D Cordura printed in standard desert flecktarn. 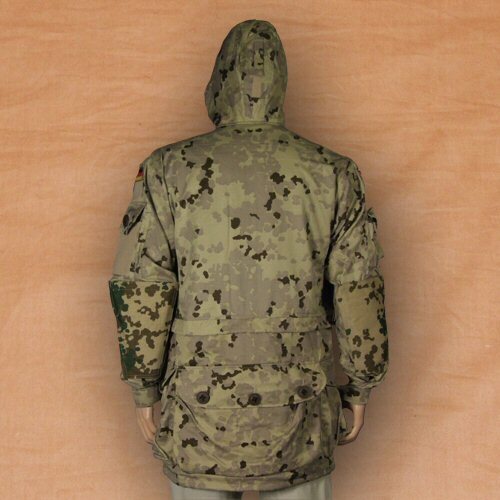 Back and arms are not lined to prevent buildup of heat and weight on areas which are needed for movement or usually carrying rucksacks, assault bergens and hydration carriers. Latest original German Army field camouflage with colouration adapted to desert and urban (concrete and clay tile) settings. View of rear of smock, showing the rear pocket and the elbow patches. Side view of the smock, showing the high collar integrated into the hood, left arm pocket, side pockets and velcro patches. 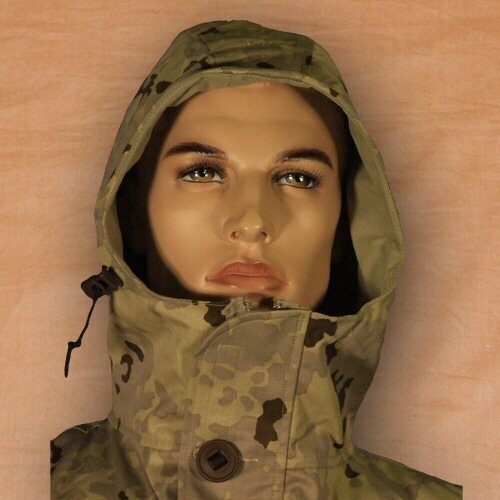 Close view of the hood showing drawstring with adjustable toggle and high collar. This is designed to help limit exposure to blowing sand. 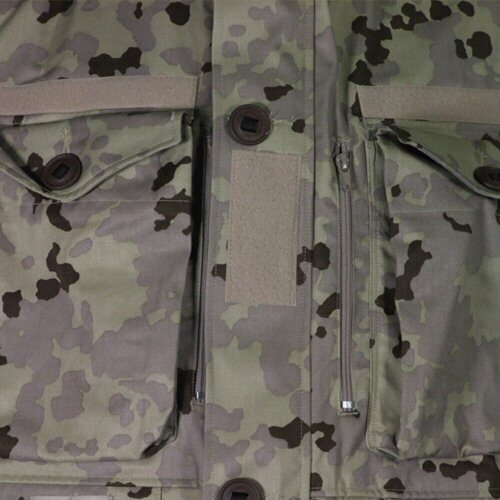 Close up view of the front chest showing the zippers for dump pockets, chest pockets and baffle with slotted button and velcro patch. 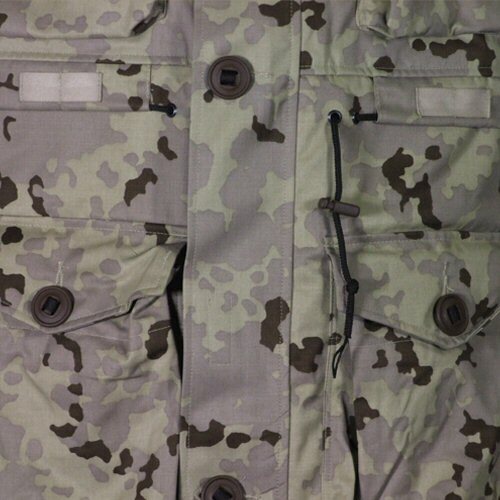 Close up view of waist showing drawstring, lower front pockets, twill tape sections right and left and the baffle with waist slotted button. Close up view of the left arm pocket which is large and flat. This is useful for holding documentation such as maps, shooting ballistic data and ID.